Guest editorial: This special issue provides an opportunity for academic and industry professionals to discuss the latest issues and progress in the area of RTMC (real-time multimedia computing). 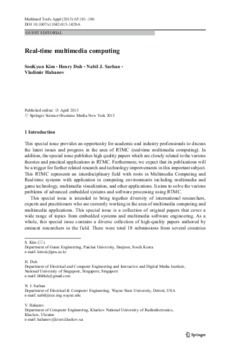 In addition, the special issue publishes high quality papers which are closely related to the various theories and practical applications in RTMC. Furthermore, we expect that its publications will be a trigger for further related research and technology improvements in this important subject. This RTMC represents an interdisciplinary field with roots in Multimedia Computing and Real-time systems with application in computing environments including multimedia and game technology, multimedia visualization, and other applications. It aims to solve the various problems of advanced embedded systems and software processing using RTMC.